Every year, Ariel’s friends around the world come together to give every Ariel resident the opportunity to celebrate Passover with dignity. From sponsoring Passover food packages to a seat at the Ariel Seder, you can step into the Ariel story by allowing the city’s less fortunate to relive the experience of redemption. 130 Passover food packages providing the most basic Passover goods for needy families. With a $50 contribution we can match funds and deliver a package worth $135. 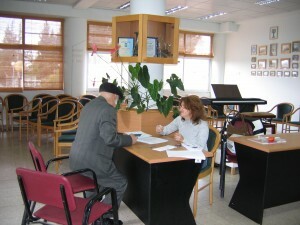 1000 food coupons for senior citizens, largely Russian immigrants who live on Social Security. Sponsor a senior for only $18. A community Seder for 120 Ariel residents who cannot make a Seder on their own or who have no family with whom to share the holiday. Your contribution of $36 will sponsor one participant. Friends of Ariel is pleased to partner with Ariel Development Fund, Ariel’s Council for Religious Affairs, and the Department of Social Services on this critical project. Together, they will provide $30,000 towards this project. We’re turning to you, our friends, to close the gap so that no one is left behind. 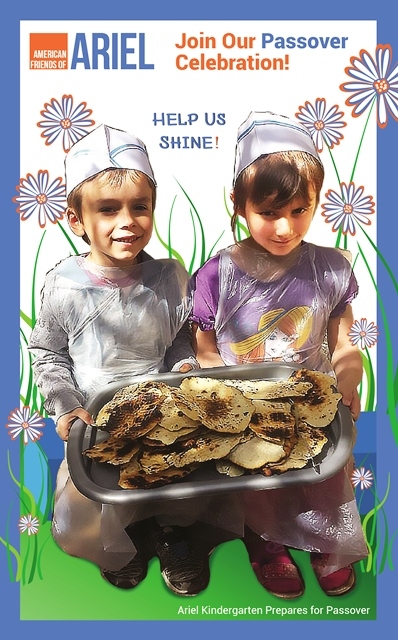 Please help us make up the $8,000 required to support Ariel’s neediest families this Passover. Your secure, on-line contribution is tax-deductible in the US. Some people just can’t contribute, but that doesn’t mean you can’t join our community. “Like” this campaign, join us on Facebook, and spread the word via e-mail and all your networks.